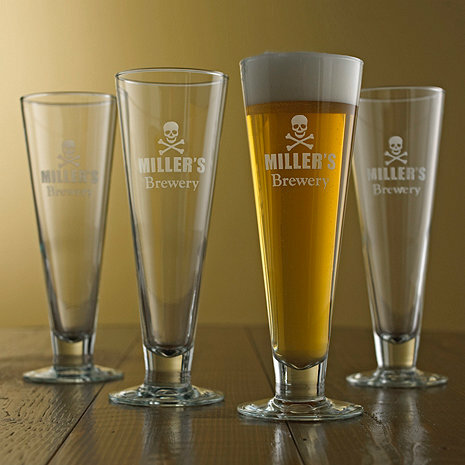 The defined shape of the Pilsner glass can be seen across any room, and now it comes with skulls and crossbones. Personalize with name up to 12 characters, including spaces/punctuation. Font size, color, or position cannot be changed. Graphic and sayings are standard and cannot be changed or removed. ""'S"" (apostrophe + S) is not automatically added to personalization. ""'S"" is counted as 2 characters (apostrophe + S) and must be requested at time of order. Am I able to purchase these specific Pilsner glasses totally clean of graphics and personalization? Only interested in the design of the Pilsner!